Andy Redfern is the co-founder and CEO of online retailer EthicalSuperstore.com, which is based in the North East, and sells a large range of successful fair trade and environmentally friendly products. How long has EthicalSuperstore.com been going? We launched as EthicalSuperstore.com in October 2006, so we’ve been trading now for two and a half years. We’re a venture financed startup, and have had four rounds of funding which has helped take us from being just two guys in an office to a team of 40 staff with a 20,000 sq ft warehouse. Our turnover will be around £6½m in the year to June 2009 and are on course for £7½m to £8m next year. We’ve also recently merged with NaturalCollection.com, another ethical/green retailer. What was your background before launching Ethical Superstore? My background before getting into online retail was as a tech journalist; I worked for PC Magazine, Personal Computer World and Byte. After this I had a career swerve and spent eight years working for Traidcraft on its e-commerce system, and have also been involved with Cafedirect before launching Ethical Superstore with co-founder Vic Morgan. Why did you decide to start selling fair trade products online? How much of a niche market is it? A survey by the Co-operative bank estimates the size of the ethical / green market at £34bn in the UK overall, while the food sector alone is worth £4.5bn. Online retail in general is on the up, which is still experiencing double digit growth. Fair trade is on an upward trend, with sales up 40% year on year, and similar figures for the organic market. So we’re fortunate to be involved in two growth sectors. Well, until we launched, buying fair trade and organic products was difficult; you could buy 400+ products from Traidcraft, others from elsewhere, but each purchase was separate and required a delivery charge each time. The same applies to supermarkets; while you can find some products there, it isn’t easy. We thought that there must be a market for people that want to buy these things from the same place. We also wanted it to be a neutral brand, the superstore is for the brands; Divine, Cafedirect etc, rather than to be the brand itself. These brands are the stars, we just provide the platform to sell them and tap into the loyalty and attachment that customers have for them. One of the reasons for the merger with Natural Collection was to allow us to have our own label though, and we will be launching a new range of branded products soon. You have a large product range online, what challenges does this present? Yes, we now have something like 7,500 SKUs. The biggest challenge is that stock takes cash and this can be a strain in the difficult economic situation we are in now. We get around this with clever use of technology. For example, we are integrated with our food and wholesale suppliers as if their warehouse is our warehouse, so we don’t have to hold all the stock at once and we can do back to back orders if we don’t have something in our warehouse. The busiest month so far was December 2008, when we had 18,000 orders to send out, 1,000 a day at times. It’s challenging but we would need to see these levels double before we need more warehouse space. You wrote the software for the site yourself, does this allow for greater flexibility? I wrote a whole new way of handling the back end systems, and this is something that has been reengineered several times. The flexibility helps us to integrate new features quickly, reviewing systems, wish lists and so on. When the VAT cut was announced last year, we were just an hour behind Amazon in making the adjustments to our site. Many retailers see an e-commerce site as something they have to do, a necessary evil, but we see it as being a tool where we can deliver maximum benefit to customers. There are two ways that customers see us; Through shopping on and browsing our website, and when they have products delivered. We have to make the most of our opportunities, so we give them a great box, excellent packaging, while 40% of our orders will have a little extra in them, a chocolate bar etc to provide the smile factor. The website experience and delivery are two things which make a big difference and we make a big effort in these two areas. When we started, we had to overcome the hygiene factor i.e. do people trust your site with their card details? Will they receive their orders? We worked hard on over-delivering, so 40% of our orders will be sent next day, even if the customer has not been promised this. For those people that receive this service, it makes them feel good, so we prioritize for first class postage and next day delivery. How did / do you deal with making customers trust the site if they haven’t heard of you before? First of all, and this is very basic, making sure every page on the site works. If potential customers see errors this will set alarm bells ringing. We take testing very seriously. After this, you need to be clear who you are, so we provide a clear contact number all the way from the homepage to the checkout, this reassures people that you are a real business. Another thing, which we were initially skeptical about, is the extended Geo Trust verification offered on IE7, but this actually resulted in a small uplift in the number of completed transactions when we used it, there is something reassuring for customers in the way that the browser bar goes green. I actually thought you meant Verified by Visa and similar security measures at first, what’s your experience of that? I don’t have a positive word to say about that, when we first went live with it, we experienced an immediate 6% drop in our conversion rates. Part of the problem is that the first many people know of the Verified by Visa scheme is when they encounter it on a retailer’s website after purchase, and all they see is a screen asking for details about date of birth and so on. Now that retailers like Argos and Tesco also have this, the situation is a little bit better and there is more understanding of what it is. The banks didn’t communicate what it is to their own customers so it took many by surprise. It was ill-conceived, and appallingly communicated as if banks didn’t understand what online was all about. Have you thought about getting rid of it? Well, Amazon have not implemented it and are dropping hints about not doing so but for us, if we take an international Maestro card for instance, and don’t verify then we risk a $20,000 fine. We’re not obliged do it with MasterCard until 2010 so we haven’t done this yet. The benefits of extra conversions by dropping it outweigh the risks of fraud. How has your checkout design changed? When did you decide to enclose the checkout? In the first version of the site, the checkout used the same header and footer as the rest of the site. This could be a problem, as users who were getting into transaction mode were seeing new offers and products in the sidebar and this could be a distraction. In 2007, we introduced a different header and footer, showing the steps of the process, and making the checkout different from the rest of the site. The changes were all about making it flexible and helping users get to the payment page as quickly as possible. Why do you make users register before the checkout? I think if you don’t make people do that before purchase, some may be nervous if they don’t need a password to access delivery details and other information. It can be a disincentive to second time purchases also, so we try to tell users about the benefits of giving an account, creating wish lists etc. It isn’t proving to be a huge disincentive for is. Another way of seeing it is to look at what Amazon does, and since so many people have shopped with Amazon at least once, this means they are used to the idea of registration. Can you give us a brief overview of your online marketing strategy? What has worked for you? We have tried everything, and basically, all of them work at least a bit is the fairest way to put it. The biggest challenge is to get past the last click wins approach and avoid giving to much credit to this. Some people might go to an affiliate, then decide to look for a voucher code before clicking a PPC ad through to the site, so how much credit to give each of these is hard to decide upon. The most successful approach that has produced sales for us is product based PPC, and this means finding out what items are being talked about and that people are searching for. Buying ads for terms liked with terms like buy or cheapest shows intent to purchase, and it is worth paying good PPC fees for these searches. You have a healthy following on Twitter – how do you approach the site? Has it worked for you? We’ve been on a while, but have taken it more seriously over the last eight weeks, since it went mainstream after Jonathan Ross and Stephen Fry talked about it on TV. I like the way that you can engage with customers in a more chatty and personal style and avoid the formality that has to come with emails you are sending out to thousands of customers at a time. People respond to different things on Twitter , so you may never get a direct sales benefit from it as you would with email marketing, but if you enter into conversation with people in a way that is respectful, then they will become aware of what you do, and some will go on to buy. A number of Ethical Superstore employees are on Twitter now, and some are tweeting regularly. We are looking at a way to use it for customer service, and have noticed the occasional comment or problem about us on Twitter; it makes sense to respond to these kinds of Tweets. Finally, what advice would you give to e-commerce startups? Firstly, you need to ask why are you going to be different from everyone else? There has to be some reason why someone will buy from you over a competitor. You need to work out what this is and concentrate on it. Secondly, you need to get the resources you need to achieve this. In our case, it was about ensuring that our website and delivery experience was the best it could be. It may work differently for other businesses, but that is the way we approached it. Once you have these things in place, everything else will follow from that. Taking shopping cart abandonment too far? 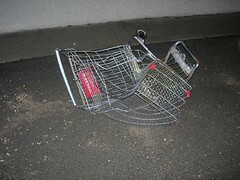 Shopping cart abandonment. It’s the bane of many online retailers and for some, accounts for a significant portion of lost potential revenue. There are a number of reasons that potential customers abandon their carts and there are a number of common-sense tactics online retailers can employ to reduce shopping cart abandonment.